Rainbow Bridge, the world's largest natural bridge, is considered a sacred place by the Navajo Indians, for whom personified rainbows have stood as guardians of the universe. This natural wonder nestles among canyons carved by streams en route to the Colorado River from Navajo Mountain's north flank. Until the formation of Lake Powell, this was one of the most remote and inaccessible regions in the contiguous United States. It is located on 160 acres of federal land in San Juan County, Utah, immediately adjacent to Navajo Mountain and the Navajo Reservation.Today, the bridge is accessible by a two-hour, one-way boat ride from Wahweap Marina. Summers are extremely hot with little, if any, shade. Winters are moderately cold with night time lows often below freezing. Spring weather is highly variable with extended periods of strong winds. Fall is generally mild. Temperatures range from 110° F in June & July to 0° F in December & January. Although precipitation is generally less than 6 inches annually, both heavy rains and flash flooding can occur. Recommend lightweight, light colored clothing in summer, including a hat. Layers of clothing are best other times of year. Most people take the water route on Lake Powell, some 50 miles from Wahweap, Bullfrog or Halls Crossing, to the landing in Bridge Canyon. The hike from the courtesy docks at the Rainbow Bridge is approximately 2.5 miles round-trip. Wear good footwear and take plenty of food and water. For using your own boat there are launching ramps at Wahweap, Halls Crossing, Bullfrog and Hite. Here, concessionaires sell boating and camping supplies and provide guided boat trips. Tour boats operate from Wahweap and Bullfrog. The nearest marina is Dangling Rope, 10 miles to the northwest. It offers gasoline, supplies and emergency service. You can reach Rainbow Bridge on foot or by horseback via the trail from Navajo Mountain Trading Post (14 miles), and on foot via the trail from abandoned Rainbow Lodge (13 miles). Before you begin a trail trip, be sure to ask a park ranger about conditions (the trail is not maintained), if trading posts are open and where water and supplies are available. Best hiking times are April, May, early June, September and October. A permit is required from the Navajo tribe. The hiking trails begin on the Navajo Reservation, where you are a guest. Respect their land. Hogans are private property; treat them as such. Do not drive or otherwise harass livestock. Leave gates as you find them. Build fires only in previous fire sites, and extinguish them completely. Better yet, carry a backpacking stove. Pack out all trash and bury human waste 8 inches below ground. Each person will require 1 gallon of water per day (minimum) in warm weather. The first publicized sighting of Rainbow Bridge was made by the Douglass-Cummings party in 1909. Two parties had set out, under government surveyor W.B. Douglass and under University of Utah Dean Byron Cummings, to seek the great stone arch that Indians said lay near Navajo Mountain. The two parties eventually met and joined forces. They were guided by Ute Jim Mike and Paiute Nasja Begay, and by John Wetherill, trader and self-taught archeologist. The country proved rough and treacherous. Horses slipped and skidded on the slickrock surfaces. Rimrock ledges, like terrible sandstone mazes, frequently blocked progress and turned the party back. They struggled through canyons, some dry and boulder-choked, some containing water and dense brush. Then, coming down what is now Bridge Canyon in the late afternoon of August 14, the party beheld this beautiful natural stone bridge. A view of the dock at Rainbow Bridge National Monument. There are two half-day trips and one full-day trip that leave from Wahweap Marina West Lake Powell. 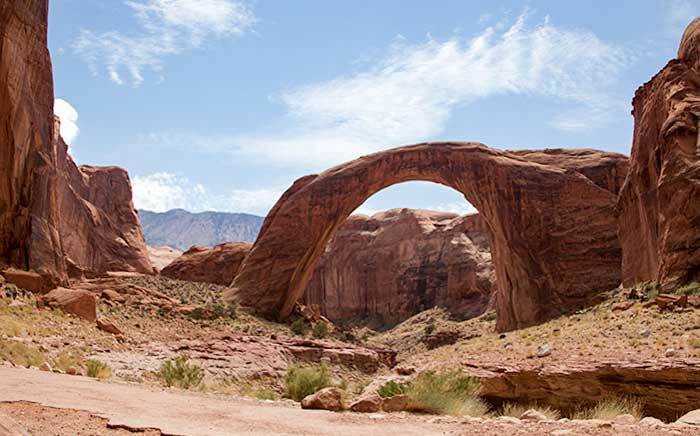 The base of Rainbow Bridge is composed of Kayenta Sandstone, reddish-brown to purplish consolidations of sands and muds laid down hundreds of millions of years ago. Above its base, the bridge is composed of Navajo Sandstone. This formation was created as wave upon wave of sand dunes were deposited to depths of 1,000 feet. Over the next 100 million years, both these formations were buried more than 5,000 feet deep by still other strata. The pressures and temperatures of this profound burial consolidated and hardened the rock of these formations. Some 60 million years ago, the landscape we know as the Colorado Plateau began a gradual uplift. Today's landscape results from the erosion caused by streams cutting into these massive layers of rock, now lifted far above sea level. As the landscape lifted and tilted, these streams acquired more force and began to downcut their meanders. As Bridge Creek entrenched itself into the landscape, the scene was set for carving Rainbow Bridge. As the canyon cut through the Navajo Sandstone and then hit the hard Kayenta Formation rock, the cutting became more difficult. The stream then widened its path and undercut the canyon walls. Finally, it cut through the neck of a meander loop. The stream then altered its course, taking the more direct course through the break. Huge flakes of sandstone broke loose and fell, leaving a concoidal or shell-like pattern like that found in the chipping of Indian projectile points. Natural flaking, called exfoliation, contributes to the formation of alcoves and natural bridges throughout this region. Dangling Rope Marina, the closest source of first aid, water, gas, and supplies, is open year-round. A ranger station there is staffed intermittently year-round. Rangers are at Rainbow Bridge daily from Memorial Day through Labor Day to answer questions and present programs on the natural and cultural history of Rainbow Bridge. They are there less frequently other times of the year. 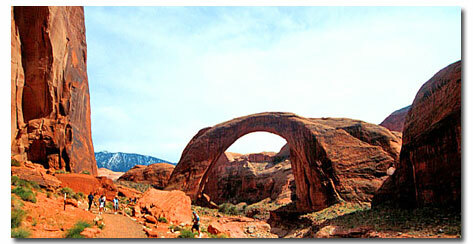 There is no entrance fee to Rainbow Bridge, but fees are charged to enter Glen Canyon NRA. Commercial fees/rates are available upon request to ARAMARK (1-800-528-6154). There is a small ranger station at Dangling Rope Marina, approximately 10 miles south of Rainbow Bridge. Dangling Rope is accessible only by water. This ranger station is staffed by park personnel on an intermittent basis. There is also bulletin board information at Dangling Rope and outdoor exhibits at Rainbow Bridge. Hunting and carrying firearms are prohibited. Destruction, cutting or removal of plant life, other natural features or Indian artifacts is prohibited, as is defacing sandstone with names, dates or any other marks. Camping and kindling fires are prohibited. Use common sense for safety. Please respect the right of others to contemplate the bridge. Swimming, diving, fishing, climbing and rock throwing are prohibited in the monument. With a span of 275 feet, Rainbow Bridge gracefully arches to a height of 290 feet. The top is 42 feet thick and 33 feet wide. The bridge's predominant color is salmon-pink, with dark stains called desert varnish, caused by iron oxide (hematite). Afternoon sunlight makes the coloration especially brilliant.